I’ll start with “admirable.” From the time of Abraham Lincoln’s presidency until that of Lyndon Johnson a Democrat, African-Americans had a strong reciprocal relationship with the GOP. With that in mind, it’s not too difficult to understand, from a historical standpoint, how he could make that choice. There is another reason that I find Michael’s choice “admirable.” The lack of African-Americans in prominent positions of authority within the party has been a persistent point of consternation for Blacks throughout the nation, and I have to admit that seeing him being interviewed in 2008, representing the party as head of the Republican National Committee, wearing a baseball cap on occasion, speaking with occasional “street slang,” and vowing to diversify the party, and expand the republican “big tent,” offered a measure of hope that, perhaps, given the emergence of then candidate Barack Obama, the republican’s may have found the right man to counter the drift towards homogeneity the party had taken. But alas…..
After, what turned out to be, an expected loss to now President Obama in November 2008, the party decided to circle the wagons around their fundamentalist right-wing dogma, and in spite of leading, what turned out to be a remarkably successful 2010 mid-term election run for Republican candidates (the Republican’s gained 60 House seats, 7 seats in the Senate, and 7 Governorships), Michael found himself “odd (at least to their way of thinking) man out.” In January 2011 was replaced by Reince Priebus. For all of the party’s finger-pointing, casting aspersions upon the chairman,and, in my opinion, not giving him proper credit, one thing was true. Michael had correctly pointed his finger at a whole host of problems, that would come back to haunt the party in ways that, though it shouldn’t have, seemed to catch them completely by surprise. Watching and listening to Michael in the weeks leading up to the November, though it was obvious that he wasn’t surprised. With the republicans, having moved away from their 2010 mantra of jobs, jobs, jobs to an all out assault on social programs, women’s right’s, voter suppression, anti-union efforts, their reluctance to discuss immigration reform, their fundamentalist attitude’s about marriage, his frustration with the party could be seen on his face and heard in his voice. So, this is where the “bewilderment” comes in. Why, given the way they treated him and the direction the party has taken, would Michael want to, again run for chairman of the RNC. Could it be that his love for his party is greater than his disgust with what they have become? Could it be that what he wants is his party back? “The Party of Lincoln?” The party of Frederick Douglas? The party of Ward Connerly? The party of Theodore Roosevelt and Dwight Eisenhower? Could he want it back? 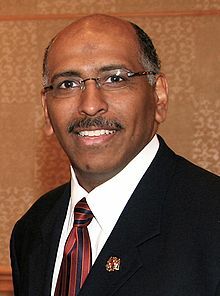 Again, I am not a Michael Steele fan. I am, though, a fan of commitment, a fan of devotion. It’s clear to me [that] Michael’s commitment and devotion extends “to and beyond” his party, to all of America. So go for it, Bro. This time, though, I hope they love you back. Ike I am truly amazed, again at your insightfulness. I consider it a blessing and privilege that you are my brother. I simply wanted to jot down a small word so as to say thanks to you for the lovely hints you are giving at this website. My extended internet lookup has at the end been rewarded with reliable information to write about with my neighbours. I would believe that most of us website visitors actually are undoubtedly lucky to live in a perfect site with so many awesome professionals with good opinions. I feel very lucky to have used your entire webpages and look forward to many more fun moments reading here. Thanks once more for a lot of things.